Kop Hill, located in the Chilterns, an area of outstanding natural beauty, near the market town of Princess Risborough, Buckinghamshire, played host to an estimated 15,000 plus visitors over the weekend of September 19/20th 2015, as the setting for an annual hill climb event which is now in its 7th consecutive year. Covering a distance of 0.7 miles, with an ascent of 324ft, the hill has an average gradient of 10% over its full length, but close to the top it reaches 25%, making it a good test for brakes and clutch. As in previous years, the vast range of vintage, classic and performance cars and motorcycles did not disappoint, with over 500 vehicles taking part. Of particular note was the high number of pre-war vehicles, the oldest of which being almost a century old. What many may not know is that Kop Hill first staged a hill climb in 1910, which makes it one of the oldest venues in the UK for such events. In those early years, the hill witnessed such illustrious names as Malcolm Campbell, driving his 12hp Talbot Blue Bird, and Count Zborowski in an eight cylinder, aero-engined, GP Ballot. However, by 1925 concern was growing for the safety of spectators at such events, and following an accident on the hill in which a spectator's leg was broken after being hit by a car, Kop Hill became the site of the last competition hill climb staged on a public highway. Enough of the history, the modern, revival event might be more about show than about competition, but what a show. Some highlights this year included the 24 litre, two tonne monster Napier-Railton capable of 165mph plus owned by Brooklands Museum and the 1922 Isle of Man TT winning Sunbeam Grand Prix car, both of which ran the hill. But it's not all about vintage, famous petrol-head and Jamiroquai frontman Jay Kay thundered up the hill in his bright green Ferrari LaFerrari to wow the crowd. Also in action on the hill were a number of Triumphs of the non-TR variety, including a 1929 Super 7 Special, 858cc/7hp; a 1933 Gloria Special, 1767cc; and a 1938 Triumph Dolomite, 1767cc, to name but a few. TR Register Chiltern Group cars, plus some from further afield, including the Glavon group, drew a lot of interest from visitors, including rallying legend and event patron Paddy Hopkirk, who stopped by for a cuppa and reminded us that he had driven a TR3A to victory at the Circuit of Ireland in 1958. Hopefully, he has now forgiven Triumph for firing him after a later event, where he continued to drive the Stelvio Pass on a flat tyre and in so doing destroyed the car's suspension. With its display of up to 22 Triumphs at various times over the course of the weekend, the TR Register required the largest pitch on the field and had more cars on show than any other club. Our stand was well organised and the hospitality shown to members and visitors alike was second to none. It was a delight to be greeted with a warm welcome, hot drinks and a fry-up after a chilly early morning drive. Several group members chipped in with supplies, and also to help with the catering, under the watchful eye of our Head Chef Dave Broomhead. Our thanks goes to all those that helped. Chiltern Group Leader Peter Bowden reported that the group signed up several new members at the event, proving that it's not all about eating, drinking and having a merry time of it. 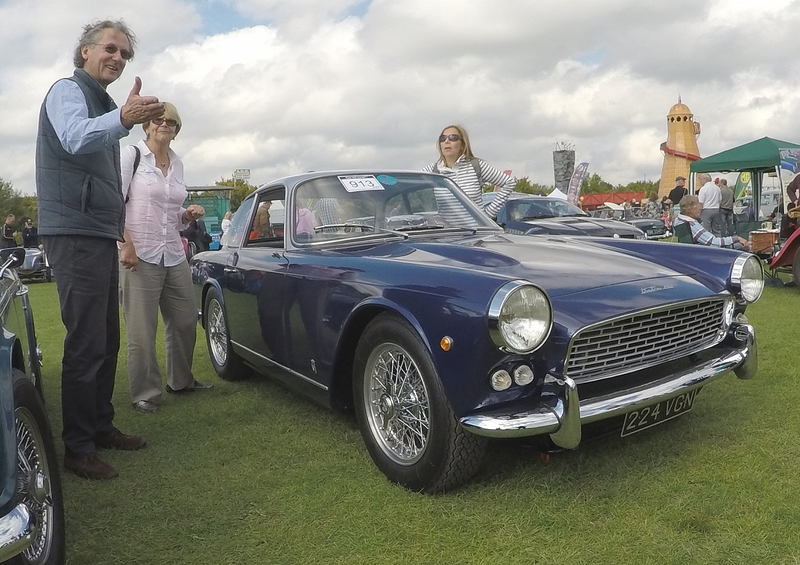 For Triumph enthusiasts, the highlight of the event had to be seeing not just one, but two rare and exquisite Italias, including Ian Tomlinson's which won the Peter Lewis Trophy for the car visitors would most like to take home, as voted for by the public. Ian's Italia also ran the hill, as did Ian Smith's 1954 long-door TR2, Roger Chamberlain's 1968 TR5 PI, and Dave Broomhead's TR6, along with well-known club member Ian Cornish in his equally well-known Triumph Works Rally TR4, 4VC, which he has owned since 1969. Nowadays, of course, the hill run is a non-competitive, un-timed event, but Ian relayed the Chief Marshal's compulsory briefing as follows, "We are subject to the provisions of the Road Traffic Act, which means a 60 mph speed limit. However, from the bottom of the hill, I am unable to see our speedometers, and I am aware that speedos often exaggerate a car's performance! The important thing is that we don't do anything silly, we obey the signals given by the marshals, and we remain on the tarmac." For modern cars and motorcycles, Kop Hill's gradient is not particularly challenging, but many of the older vehicles have to drop down through the gears in order to achieve the summit. Ian Cornish talked me through how he drives the hill, "I leave the line using 5000 rpm in 1st, 2nd, overdrive 2nd and then 3rd, which means that the car is doing about 72 mph by the time I enter the shade of the trees, a couple of wiggles and the steepest part of the climb. I don't find that transition into the shade easy as there's no white line down the centre of the road, so I tend to ease the accelerator a fraction, then ram it down hard, still in 3rd, as the trees thin and I head for the brow. As I crest that, the final marshal post appears on the right, the chequered flag is waving and so it's throttle off and brake gently for the approaching T-junction. Having an overdrive which engages immediately at 5000 rpm helps greatly, as it means just a single gear shift until some 60 mph, when I'm into 3rd." Author: Darren Cummings, TR5 owner and TR Register member. Over 400 historic cars and motorcycles can be seen at the event. Kop Hill is one of the oldest Hillclimb venues in England with the first recorded races taking place in 1910. A great event for yet another year. Hospitality from the Chilterns group is always excellent & we were made most welcome as usual. Great cars, super venue & lovely people (TR & others! ).